Entered a Lundin Mining put option in mid-December 2015 and exited in beginning of February 2016, as shown below. Quantity and value have been erased in the picture. Price-wise, a small profit of 7% but as this was a very small trade, the commissions turned this trade into a loss of 15%. My current option trading is for educational purposes. Below, you can see when I entered and exited the position when looking at the company’s share price and copper price. 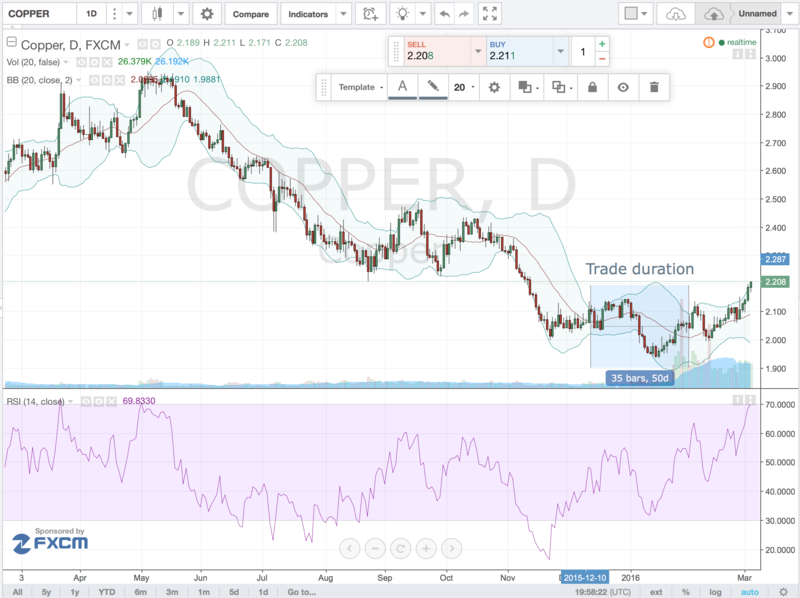 The copper price played a crucial part in this trade as it constitutes almost 2/3 of the company’s production distribution in tonnes, as shown in this earlier post. (a) At times, I was 50% up on my trade. 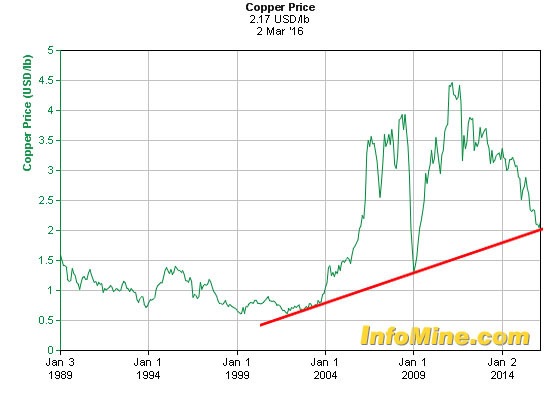 (b) Spotted a trend in the copper price fall. Haha, well, I acted, but all too late. But ”Showing up is 80% of life.” as Woody Allen allegedly has said. At least I dared to act on this case and not just paper trade and then say ”what if I had acted?”. (c) Closed the trade close to no loss, right before it turned way-out-of-the-money. I credit my gut-feeling for this as I felt the outlook for my case had started to turn on me. (a) I entered a ”short position” in the stock when the RSI was oversold in the short term, i.e. bad timing. Should have looked more into technical analysis to time the trade right. (b) This long term picture of the copper price with this simple trend line added, shows a technically strong support at where we are right now. This price could instead have worked as a downward target price and a point where to instead flip the position and buy call options in Lundin Mining, which I have not done as of yet. This trade further showed myself how important it is to pay attention to more aspects that just a few, both long-term and short-term indicators of various kinds. I will have to keep this in mind in my next trade. 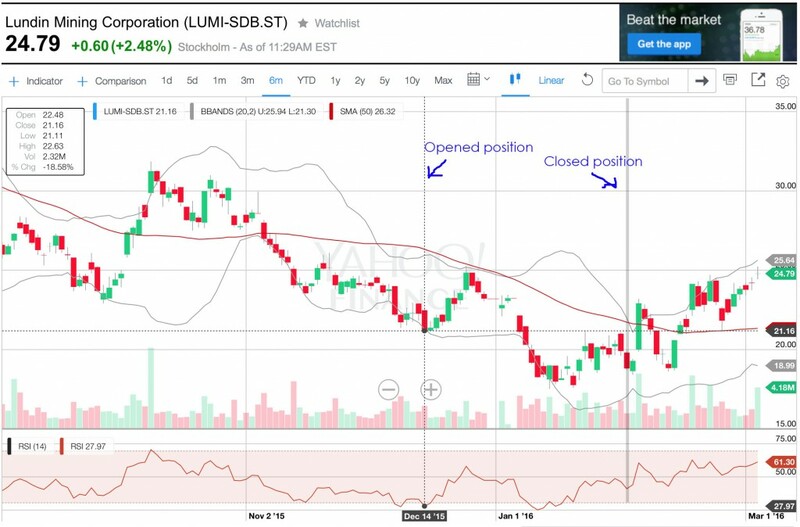 Before I continued with my research on the copper and zinc price, I took a small position in the put option LUMI6O20 earlier today. 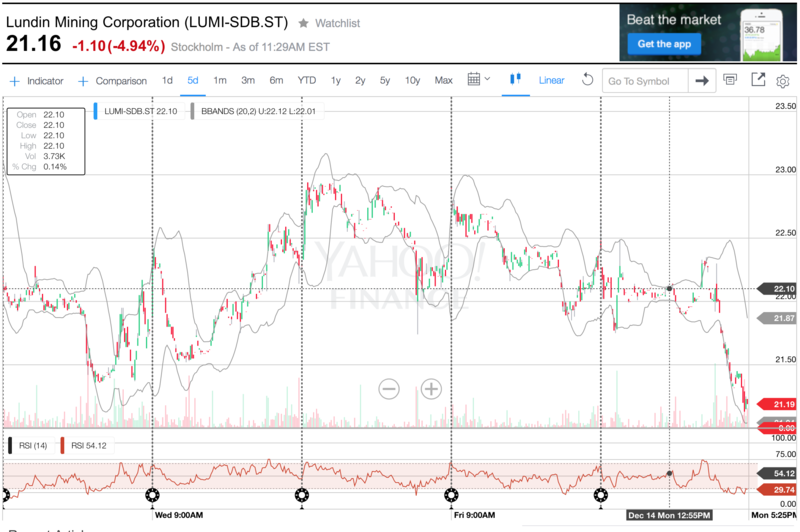 This means Lundin Mining is underlying and it matures in 2016, March 18th with an exercise price of 20 SEK. 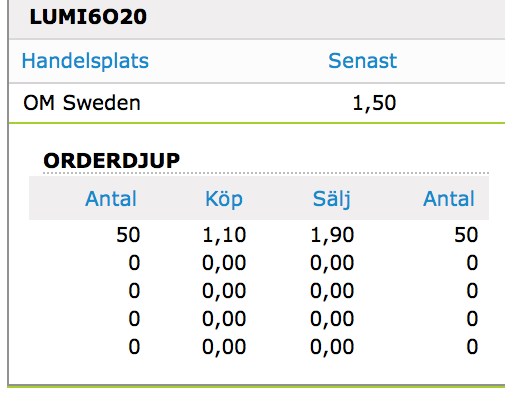 I paid 1,50 SEK per underlying share. Below picture shows the underlying share’s 5-day chart and where and when the trade took place. 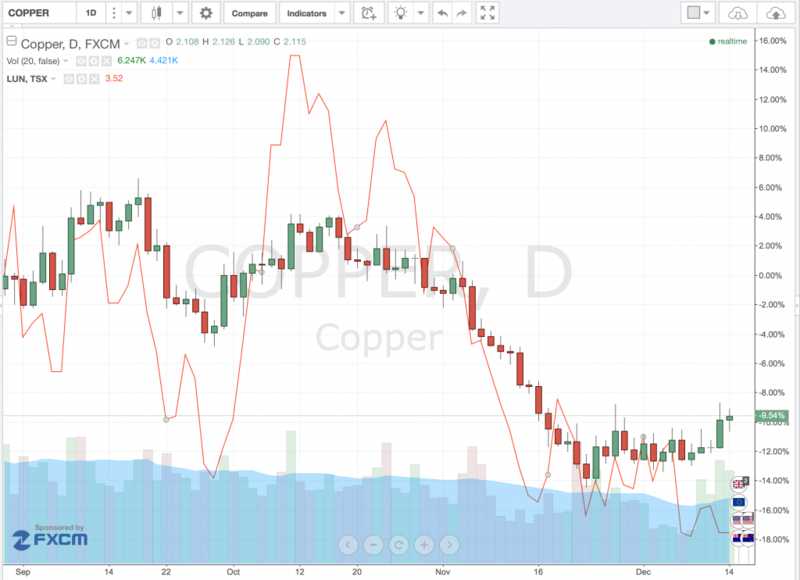 And below, roughly 3 month chart with copper price (candles) and Lundin Mining Canadian share price (red line). By the way, it’s a wonderful chart tool they have at www.tradingview.com. I just happened to stumble upon it and I believe I will have to explore it further. Well, we will see how this turns out in time. This time, I went maybe a little too much with my gut feeling, but it becomes so much easier and entertaining to follow when you have a stake in it. I’m after all still exploring these opportunities for my own educational purposes. And this is what the option was trading at by the time the market closed. 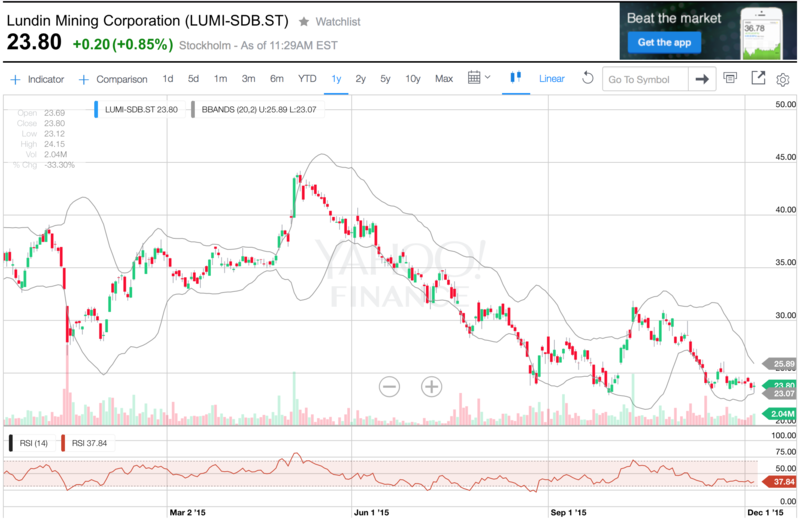 Lundin Mining has emerged on my radar as a possible good call option case. 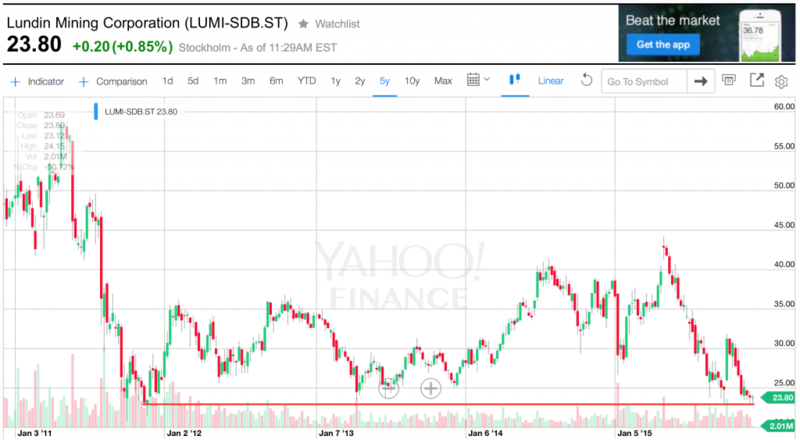 This analysis focuses on the Swedish stock and its options, whereas the stock itself is also listed on the German and Canadian stock markets. Let’s investigate if this is a good time to enter a such position. 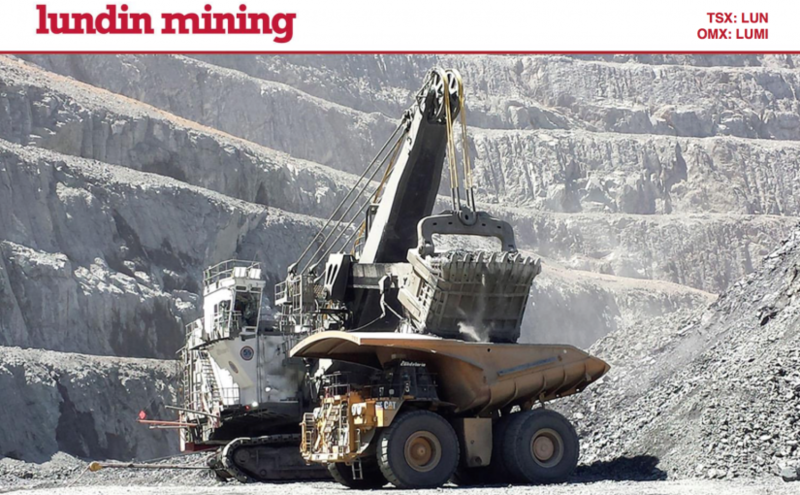 (The above picture, courtesy to LundinMining.com – Company Presentation 2015-11). The case is to buy call options with exercise price around 30 SEK which matures on 2016-06-17, which currently trades at 1,25 each, i.e. 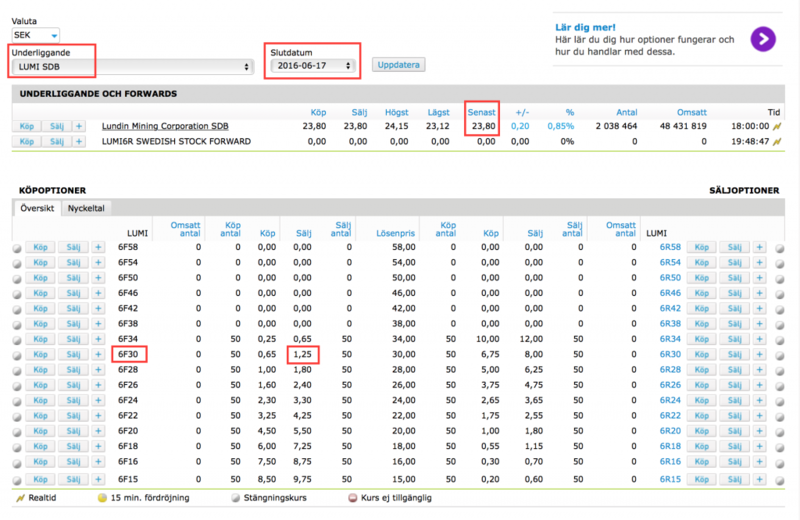 125 SEK per contract of 100 underlying stocks, excluding commission. See picture below, in Swedish. Let’s take a look at the stock. On this five year graph we can see how the stock is down to its 5 year lows. On this one year graph we can see how the Bollinger bands have started to tighten which could be signaling a future outbreak in some direction. The RSI hints us that the stock currently is close to oversold levels. I will track this stock in order to find a reason to enter this call option position and I plan on announcing my position in this blog immediately once I have entered it. What signals should we look for in order to enter this position? 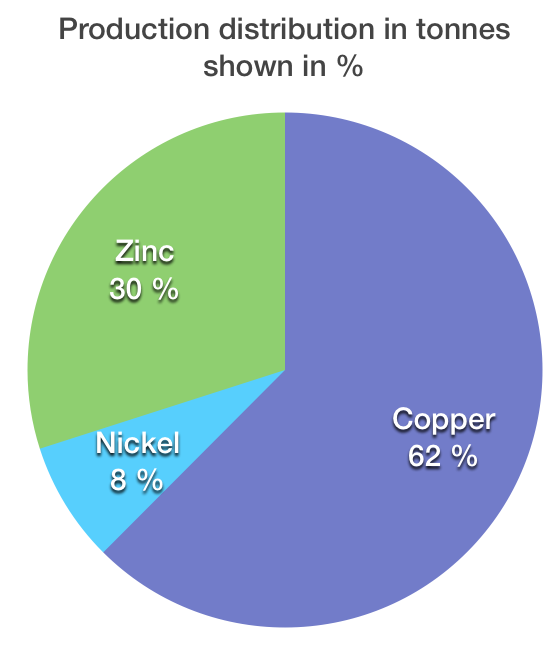 This is how their different base metals are distributed, according to their 2015Q3 report. We will switch focus to copper and zink prices in order to predict larger share price movements as we believe the base metal prices to have a larger impact on the share price than increased efficiency in operations. The above shows the copper price for the last 26 years, according to infomine.com. 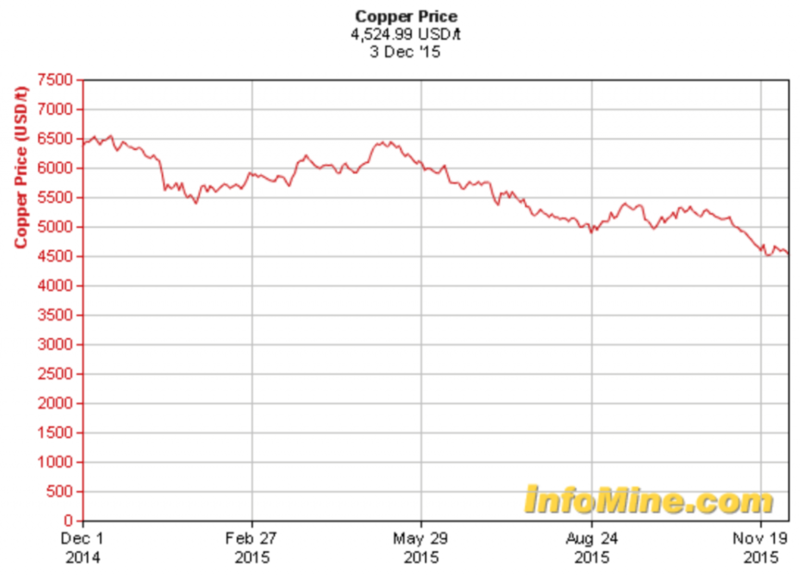 And below, copper price last 12 months. 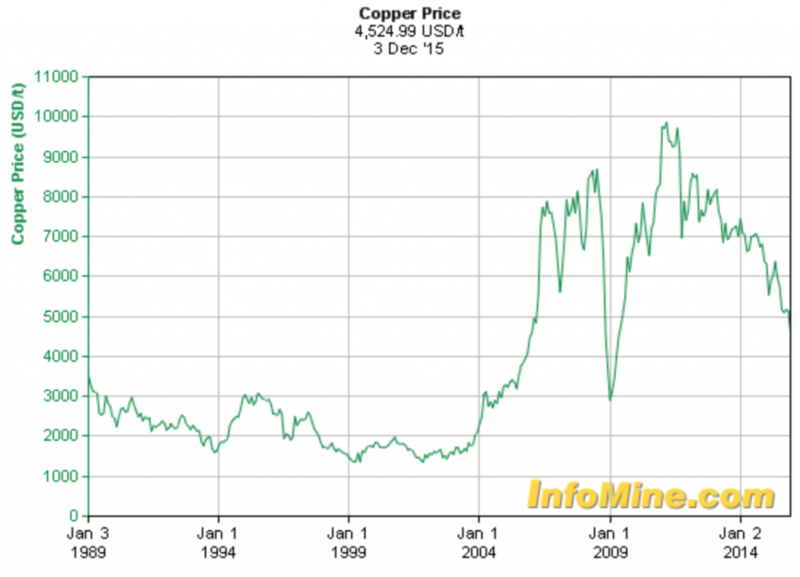 The copper price has dropped around 50% since it peaked in 2011-2012 and has dropped around 30% since its one year high. The downward trend still seem to be intact. This case now starts to look more like a put option-case than a call option case, at least in the near term. I will have to dig deeper into this. Disclosure: I currently do not own any Lundin Mining shares nor options. I wrote this article myself, and it expresses my own opinions. I am not receiving compensation for it. I have no business relationship with any company whose stock is mentioned in this article. This article should not be regarded as a buy or sell recommendation or investment advice in any way.